After sitting in a meeting for most of a lovely, sunny Sunday afternoon and with the promise of another great day on Monday, I couldn’t resist the urge to get out in woods. My main excuse reason for going was that the senior hiking group is scheduled to go to Pine & Cedar Lakes this week – a popular hike that we have done many, many times – and I had heard from reliable sources that there is an unmarked trail leading from the Pine Lake spur trail down to the seldom visited, and unappealingly named, Mud Lake. 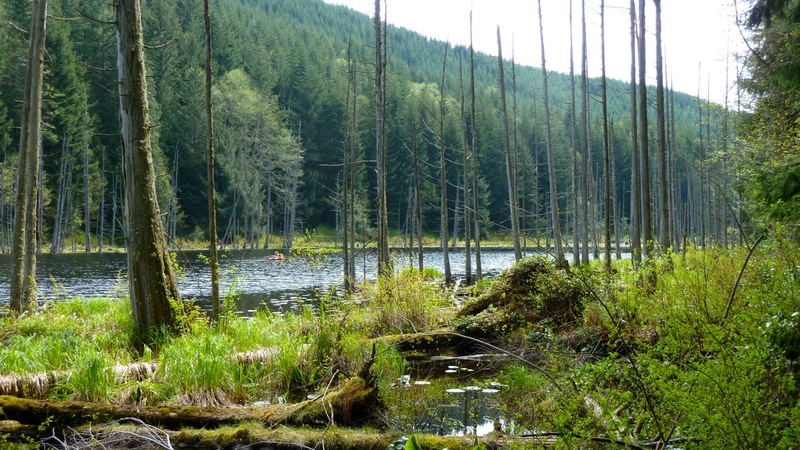 The Pine & Cedar hike is fairly difficult (the first mile is quite steep) but rather short so we generally pad it by popping over to Raptor Ridge – maybe a side trip to Mud Lake would spice things up a bit. The weatherman had been right on the money – it was a beautiful morning and I dared to leave my fleece vest in the car and stuff my raincoat and long-sleeved shirt into my pack. I got a late start, hitting the trail at 9:20, and took my time on that steep first mile but still got to the Pine Lake trail (about 2 miles) at around 10:30. The turnoff to Mud Lake was not hard to find – on our last trip to Pine Lake I had noticed and wondered about it. This time it was pretty clear to me that the first part of the Pine Lake spur runs along the remnants of an old logging railroad and the Mud Lake trail is the continuation of that line. 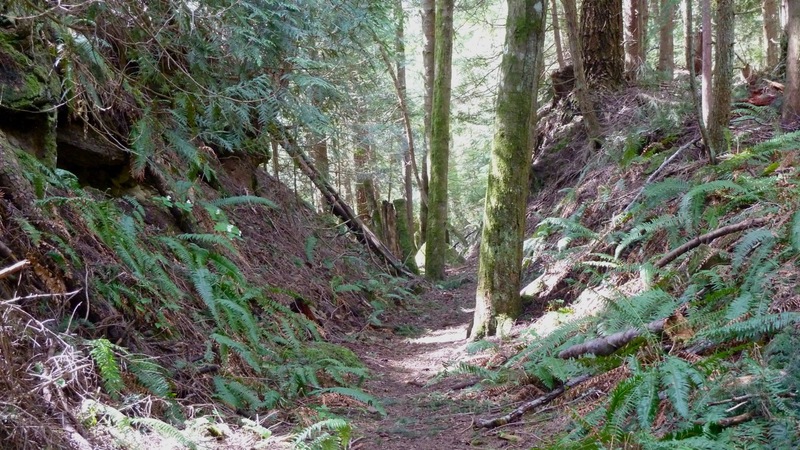 There are a couple of places where the trail passes through a narrow, and obviously artificial, cleft that is too narrow for a road but way too much effort to put into building a trail. There is also the occasional rusted piece of one-inch thick steel cable partially buried along the way. 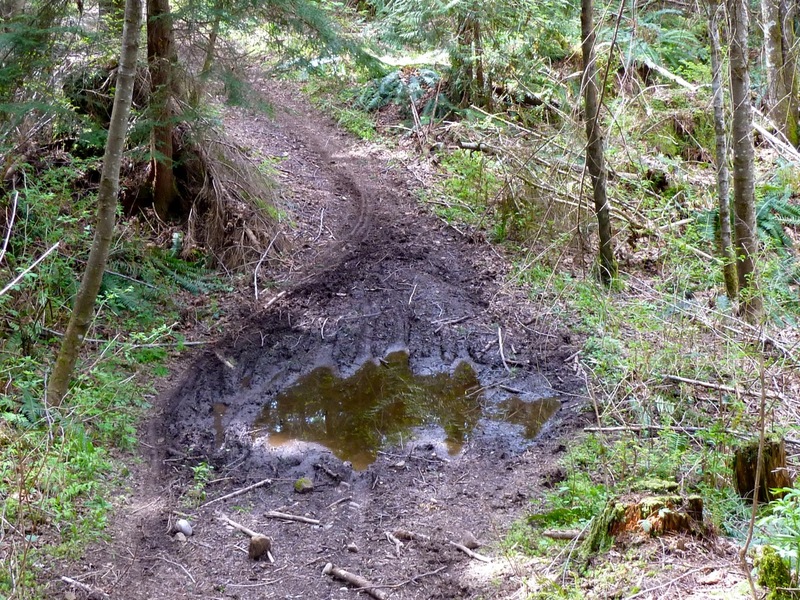 This old railroad trail continues, with occasional ups and downs and mud puddles where the slope has slumped away or an old trestle crossed a ravine, for a little over half a mile until it pops out onto a broad old logging road and begins the descent into the Samish River drainage basin. This section of road has been decommissioned and the stream culverts removed – it is shady and there is a fair amount of organic matter underfoot, so it is not an unpleasant walk. This mile is where most of the elevation loss happens. I had thought that these conditions might continue all the way to the lake but I was pleasantly surprised when the main road turned off to the south and the way to the lake became more trail-like for the last half mile – it had also been a road at one time but was thoroughly overgrown so that only a narrow path remained. Just as I reached the lake another newer road went off to the south and a couple of big Honda dirt bikes were parked at the side. I looked up the road and saw a medium-sized gray dog checking me out. A dog without an owner always makes me kind of nervous and I was pleased when it turned and trotted away – only then did I realize that it was a coyote. I tried to get a picture but had an episode of extraordinary clumsiness with the camera and caught little more than his ears as he passed over the crest of the hill. The lake itself is pretty but unremarkable. The dirt bikes belonged to two fishermen who were out in small boats. It was now about 11:30 and I was getting a bit peckish; I didn’t want to disturb the fishing so I just had a quick snack and headed back up the trail. I definitely knew I was going uphill on the way back up the road, but it was just normal logging-road steepness. I got back to Pine Lake by about 1:00 (which would have been noon if I’d left at the usual time – I was on Daylight Wasting Time) and sat down for a leisurely lunch overlooking the lake and then toddled down the trail, arriving at the car at about 2:30. And I had done the whole hike in a T-shirt! So what’s the verdict? The addition of the trip down to Mud Lake (and more importantly the “up” part) turns a moderate hike into a really good workout – it came to about 9 miles and 2600 feet of gain. There is another lovely little mountain lake but no dramatic views or other excitement. And no unpleasant surprises. It’s always nice to go off the beaten path and add a little variety to a hike. For something called Mud Lake it’s very picturesque. Great pictures.